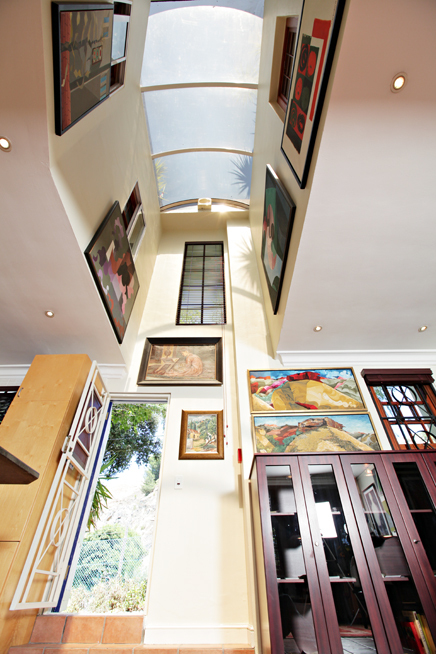 Nestled between the Bo-Kaap (the Cape Malay Quarter); Cape Town’s city centre; the V & A Waterfront; and overlooking Cape Town’s bustling working harbour; 17 on Loader Guest House offers a warm and welcoming home away from home in the heart of the beautiful city of Cape Town. 17 on Loader Guest House (which has been in business since 2002) is perfectly situated in Cape Town: it is a mere 10 minute walk from the city centre and fabulous shopping at the V & A Waterfront, and a short stroll away from some of Cape Town’s best restaurants and most popular clubs and bars. The Cape Town International Convention Centre is a stone’s throw away, and the fabulous 2010 FIFA World Cup Stadium, which is now the city’s newest and most prominent land mark, is within kicking distance of the Guest House's front door. 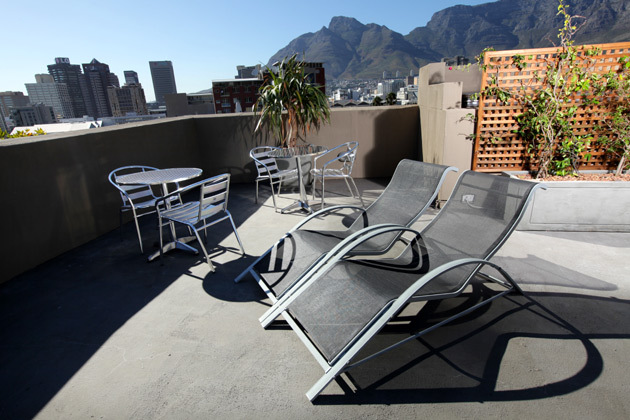 This Cape Town Guest House is situated slap bang in the middle of the only village in Central Cape Town – known as "de Waterkant Village", but more affectionately referred to as "THE Village"! An entire book can be written about this area, but suffice to say that once you have experienced first hand what the Village, and it's people have to offer, you will come back for more, time and time again. There is no shortage of things do without having to travel out of De Waterkant Village. The area is safe to wander through on foot, both day and night, and is patrolled by security guards 24 hours a day. 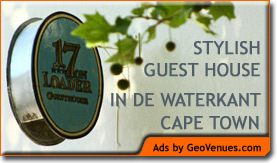 17 on Loader Guest House, in Cape Town’s De Waterkant Village, offers guests all the comforts of home, with excellent friendly service. The three storey B&B is a typical example of the Georgian architecture that is prominent in the area. There is an open deck on the roof that affords awe inspiring views of some of Cape Town’s best known landmarks: Table Mountain, Devil’s Peak, Signal Hill, Table Bay, Blouberg Beach, the V&A Waterfront, the city centre and on a clear day guests can see out to Robben Island, the prison where Nelson Mandela served much of his 27 year sentence. The deck is the perfect place to watch the sun come up over the mountain with a fresh cup of coffee, or settle in for sundowners after a long day of sightseeing. There are loungers and tables and chairs, so this is also an ideal place to relax under the warm South African sun, but be sure to wear sunscreen! 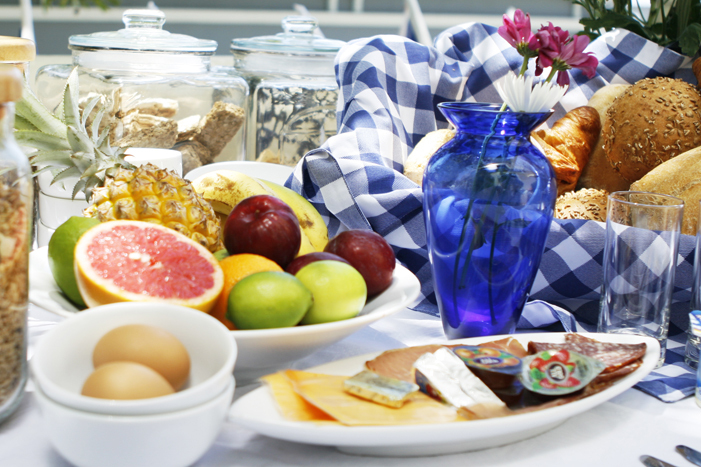 Breakfast takes the form of a breakfast basket, which is full of all sorts of goodies, including breads, croissants, meats, cheeses, jam, yoghurt and fruit. The main dining area also has a breakfast buffet for guests' and includes juices, teas, fresh percolated coffee (to enjoy with a traditional South Africa "Rusk") and an extensive selection of cereals. Guests can enjoy this sumptous breakfast in the privacy of their rooms; in the shade of the plane trees on the front patio; or weather permitting, upstairs on the roof deck while taking in the marvellous views.